Employing the potent scale inhibiting properties of high quality polyphosphate, the in-line anti-scale humidifier filter eliminates in excess of 95% of scale-forming minerals like lime, to create a near zero-maintenance furnace humidifier. The efficiency and cleanliness of your furnace humidifier will increase dramatically as the filter not only traps minerals contained in hard water, but coats them so that if they do manage to pass through they will not stick to your humidifier. This means little residue to clean out of your humidifier, and the minerals that do make it through can be cleaned with a simple wipe of a cloth. Installation is a snap, as a quick connect system is provided with the filter. Simply cut your water supply line, and connect each side to the filter. In just a few minutes, your humidifier will have the best anti-scale humidifier doing your maintenance for you. The filters estimated life span is one humidification season (usually 6 - 9 months). 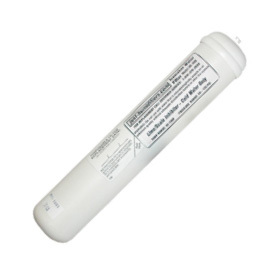 The anti-scale humidifier filter is recommended for use in homes where the autoflush cannot be installed due to drainage requirements, or homes where hard water scale causes excessive mineral build-up. Although designed specifically for the Desert Spring furnace humidifier, the anti-scale filter can be used with virtually any furnace humidifier with a standard 1/4th inch outside diameter incoming water line.